A riot of colours brighten the flower stalls at the Cours Saleya Market in Old Town, Nice in Provence, France, Europe. The Vieille Ville, the Old Town of Nice in Provence, France has an atmosphere all its own. One of the most enjoyable trips into Old Town is to visit the daily market of Cours Saleya.The Flower Market of Cours Saleya is held on Tuesdays, Thursdays and Fridays from 6.00 a.m. to 5.30 p.m. and the wonderful fragrance and rainbow of colours should not be missed. Bouquets of all kinds of local flowers can be found here, small bunches, large arrangements or potted plants to set on steps or in doorways. Monday is when antique collectors gravitate to Cours Saleya in Nice, Provence as this is the day a huge flea/antique market is held (from 7 a.m. to 6 p.m. - the Marche a la Brocante et Antiquites. 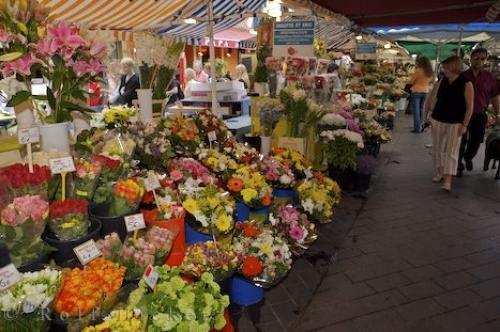 Photo of flower stalls at the Market Cours Saleya in Old Town Nice in Provence, France. ... Early rising tourists to the Cours Saleya may catch a glimpse of local chefs choosing that extra-special secret ingredient. All in all, the market of Cours Saleya in Old Town Nice in Provence, France, is an experience not to be missed. Boutiques of flowers at the markets, Cours Saleya in Old Town Nice, Provence, Cote d'Azur, France, Europe. I photographed this photo with the digital SLR camera model Canon EOS-1Ds Mark II, aperture of f/6.3, exposure time of 1/50 sec. on ISO 100, as always I used a original Canon Lens, the focus lenght for this picture was 24mm.